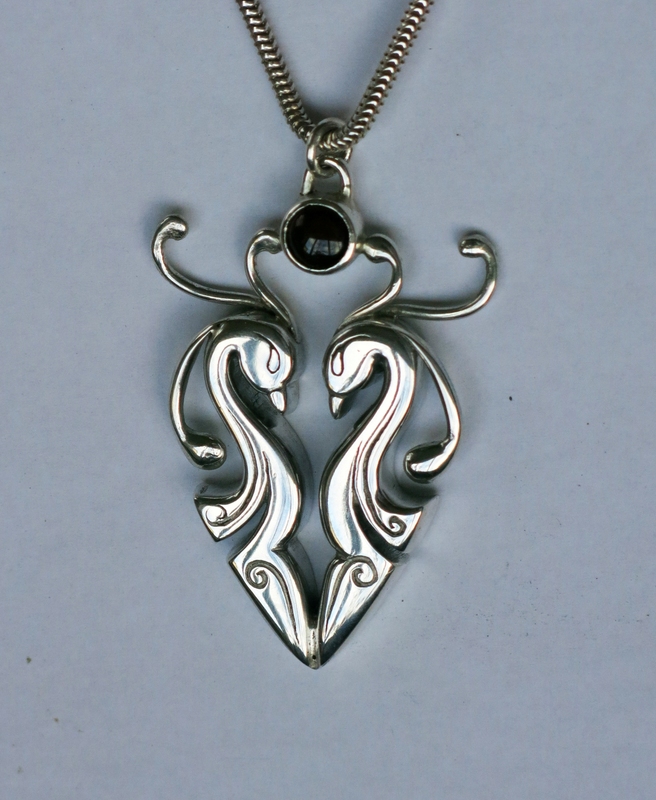 All larger pendant designs are one-offs. 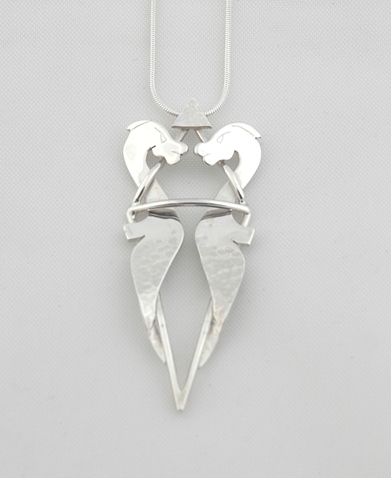 Similar designs can be made up to order or pieces can be commissioned to your own design. 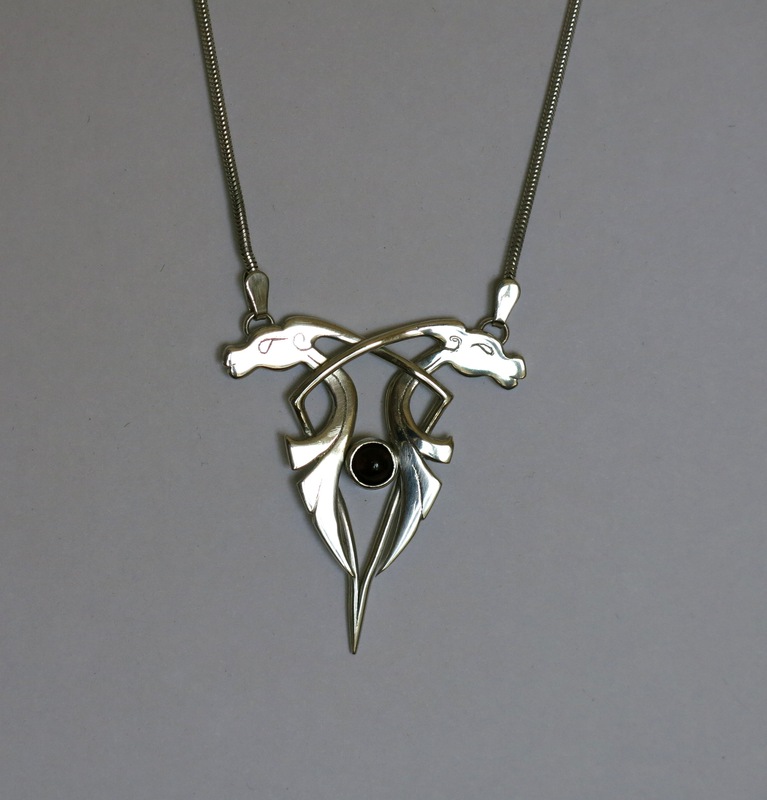 Smaller designs can be repeated and made up in any metal or combination of metals and stones. 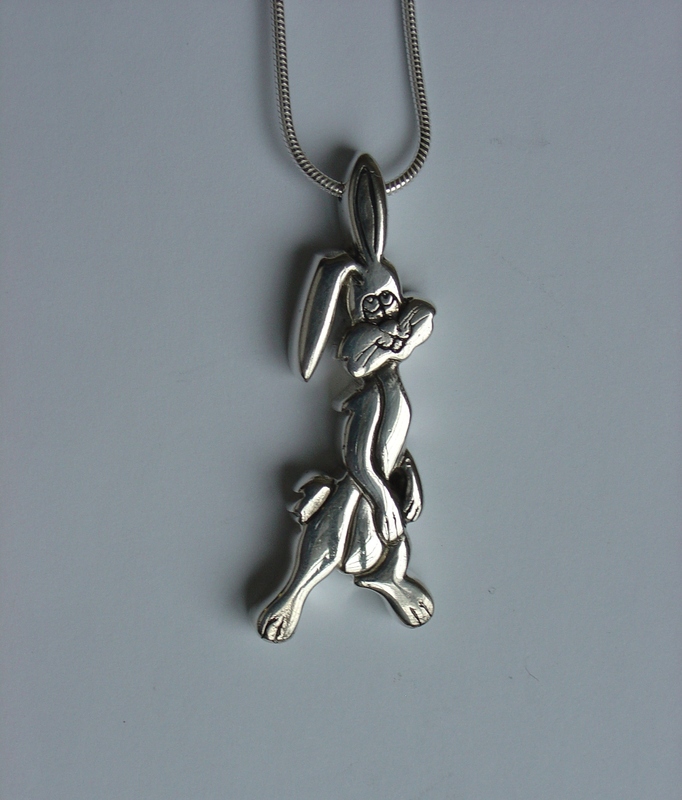 Repeated designs are still individually hand-made so may differ slightly from a design chosen. 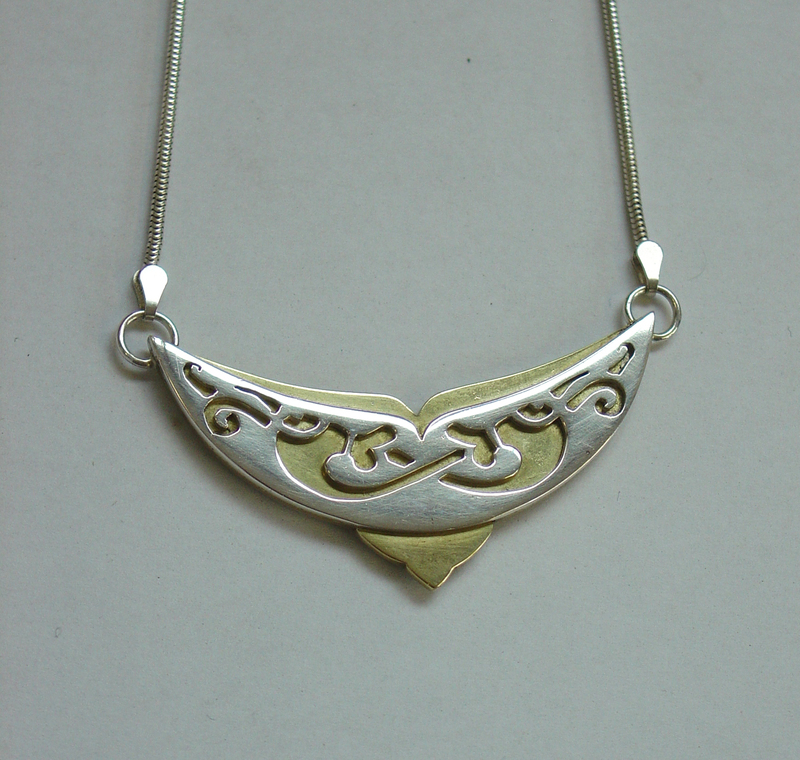 Pendants are generally fitted with a 16” or 18” snake chain but can be fitted with a range of chain designs and lengths or on a solid torc. 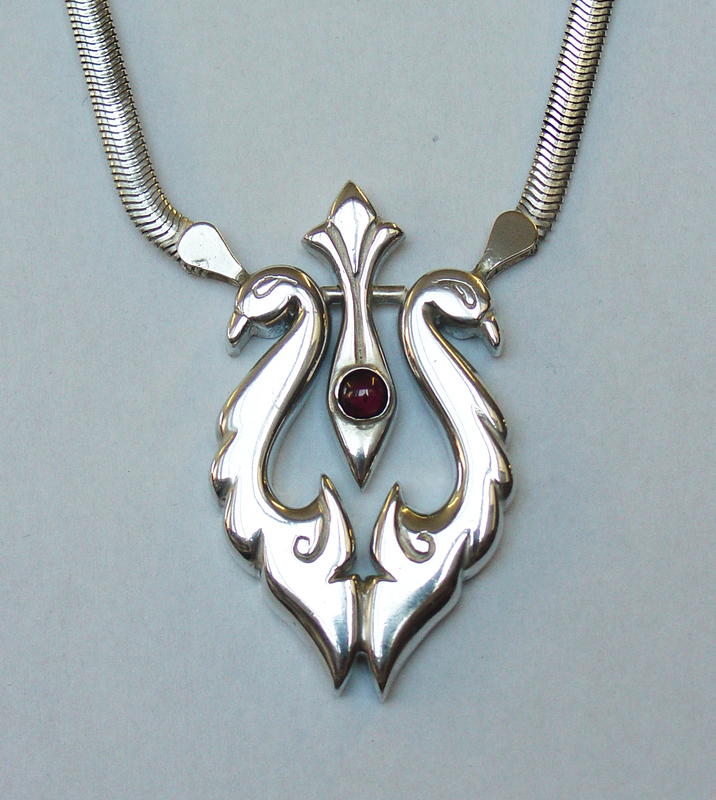 All cast pendants, including smaller pieces, are one-offs. 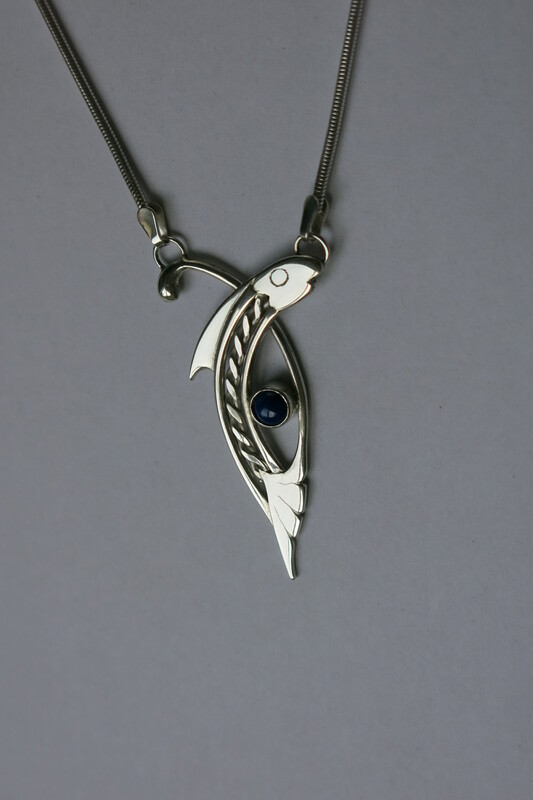 Silver sheet and wire fish with twisted wire body, set with 5mm lapis lazuli cabochon. One-off piece. 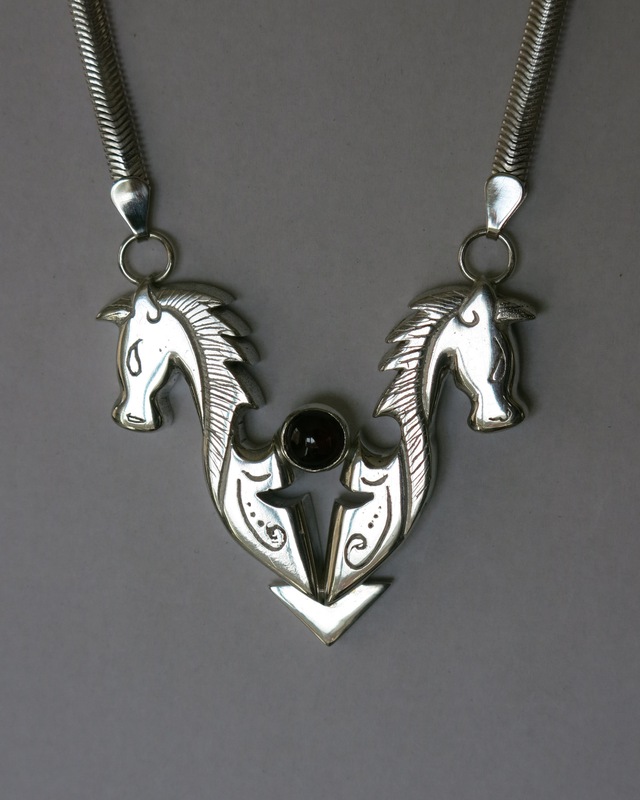 Sheet silver horses neck-piece with copper manes and wire detail and silver beading.. Set with 7mm carnelian. On snake chain. 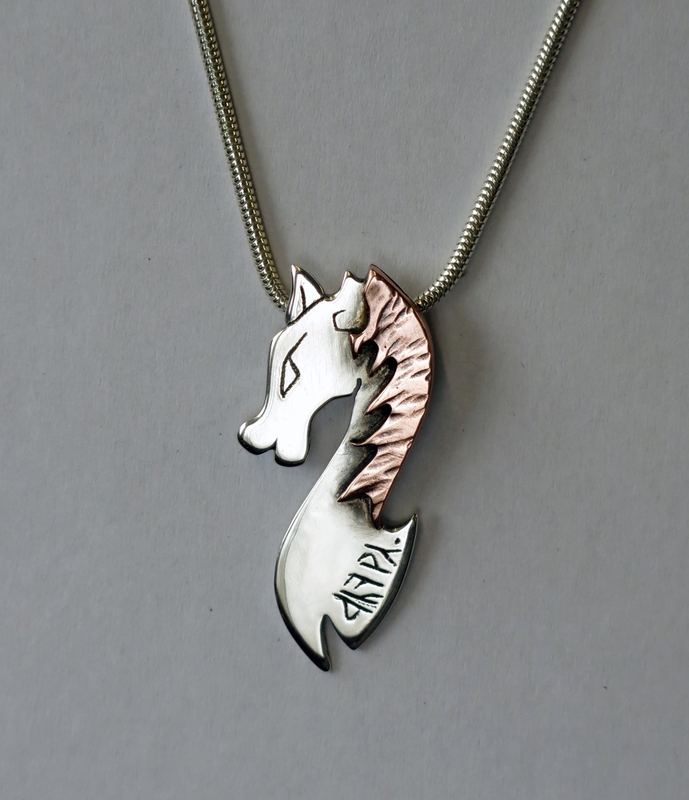 Chunky silver sheet horse with raised and textured copper mane. Engraved rune detail with black enameling. 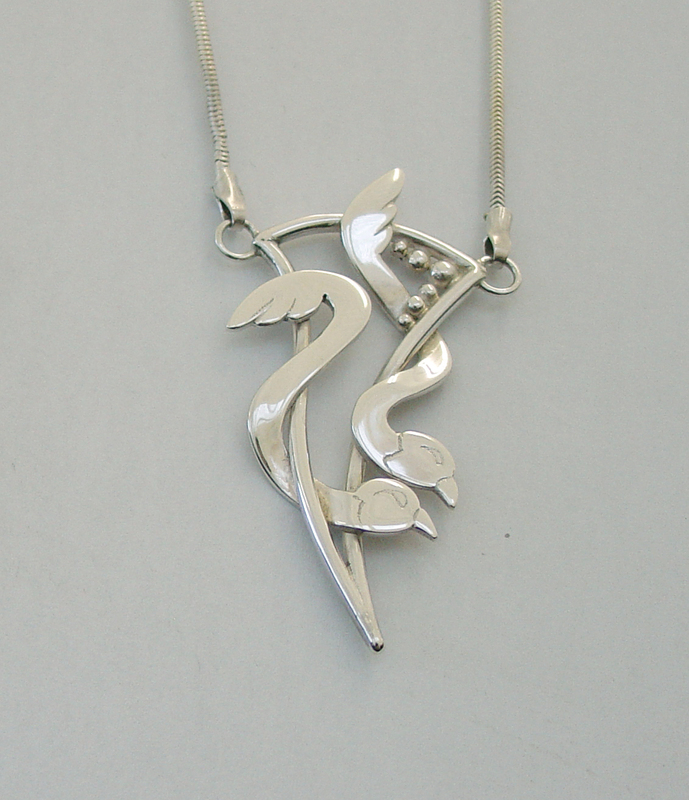 On silver snake chain. 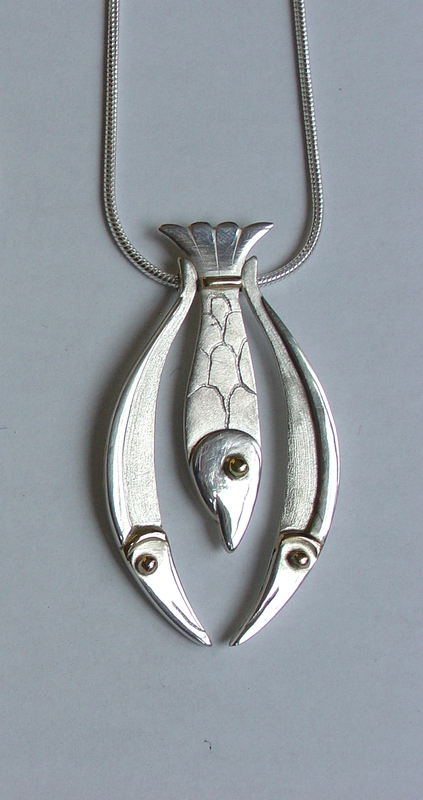 Layered silver sheet fish pendant with moving central piece and turquoise bead on snake chain. One- off piece. 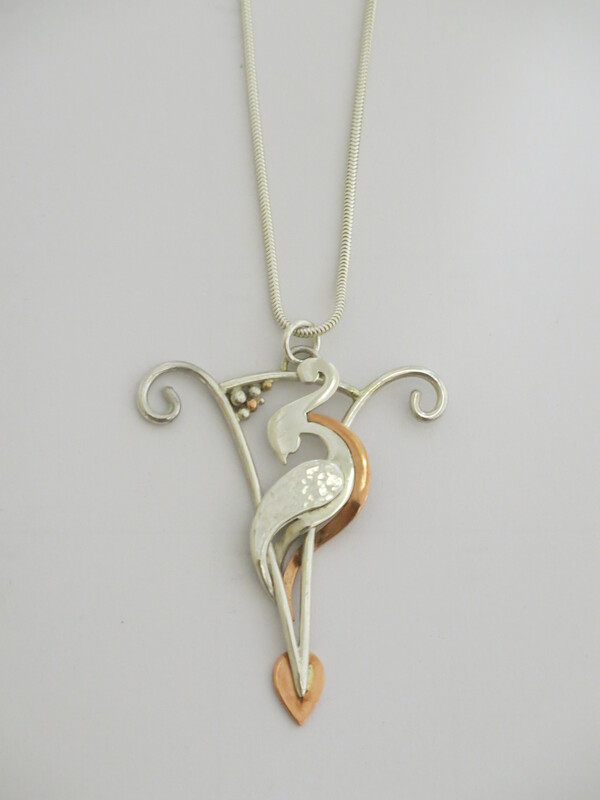 Plumed bird pendant in silver sheet with copper detail, entwined in silver wire frame with silver bead detail,on snake chain. One-off piece. 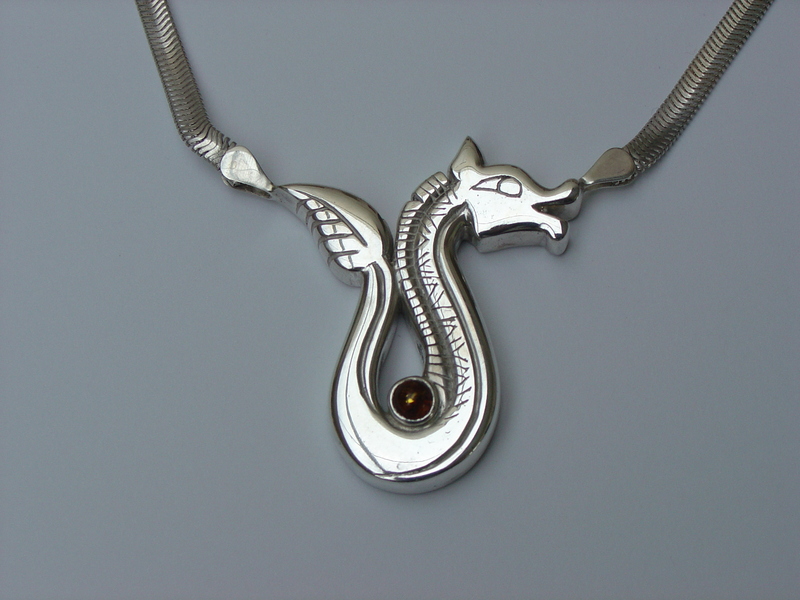 One off cast silver animal set with amber. Hung on flat snake chain. 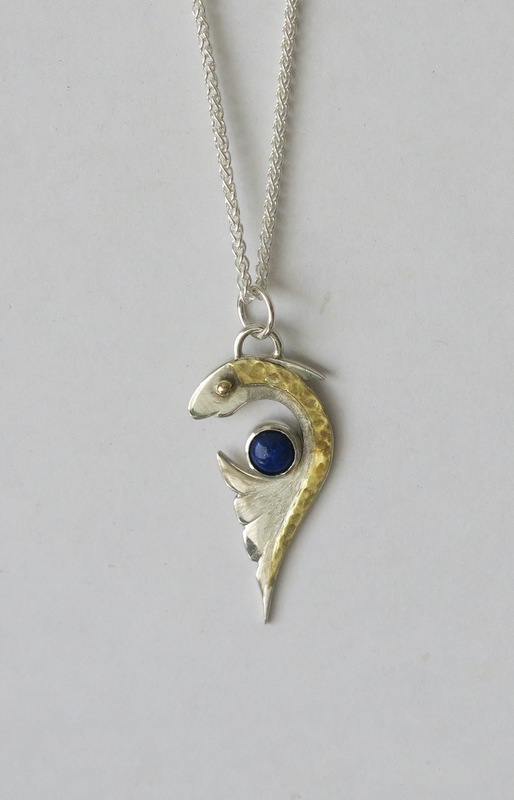 Sheet silver fish with textured layered brass detail, set with 5mm lapis lazuli. On spiga chain. Sheet and wire interwoven birds with silver balls detail. Hung on flexible links to snake chain. One-off piece. Cut out silver sheet with interlocking animal design on brass background. One -off piece. 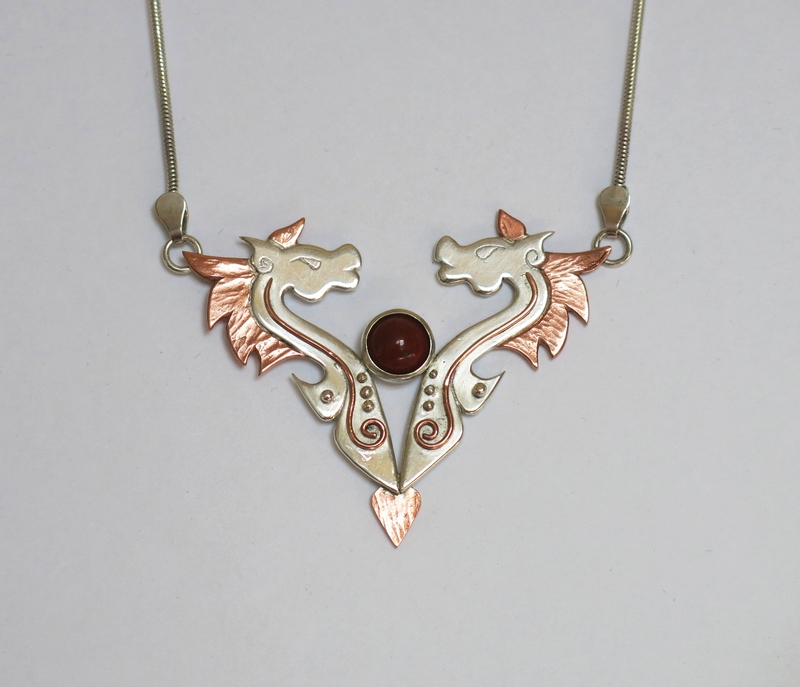 Sheet and wire interwoven animals set with garnet on flexible links to snake chain. Approx 4cm high. One-off piece. 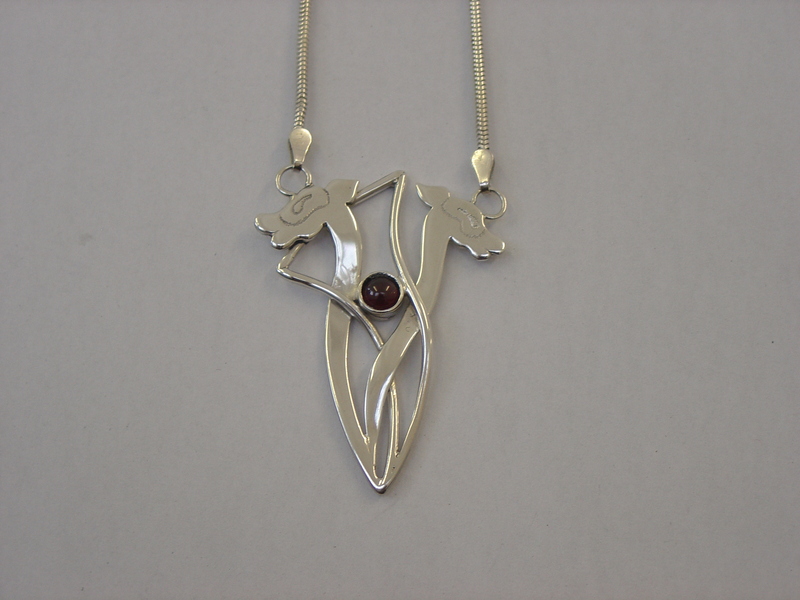 Sheet silver animals with silver wire frame, set with 5mm garnet. On snake chain. One-off piece. 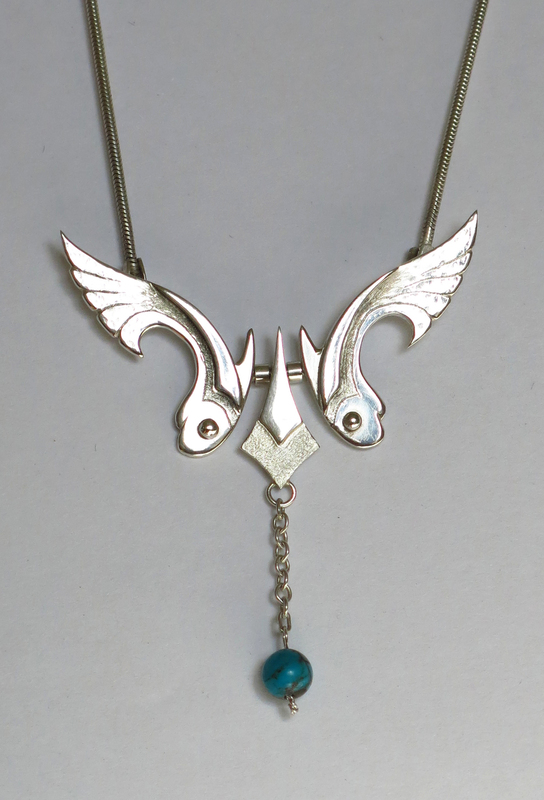 Silver birds around silver fish with gold detail. Layered silver and texturing on bodies. Hung from tubing on back on snake chain.One-off piece. 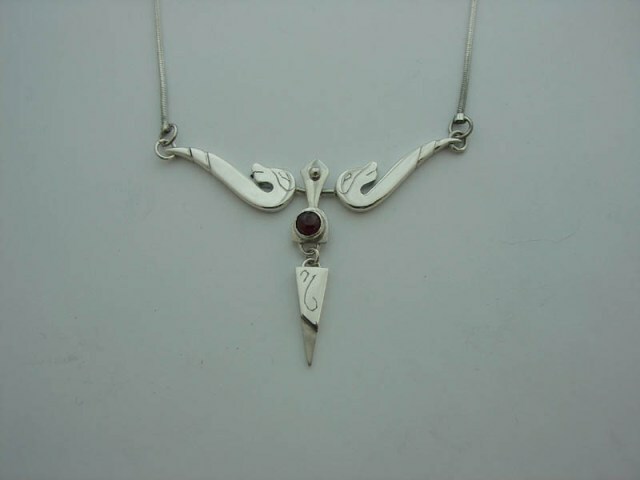 One off cast silver birds with moving centre piece set with garnet, On flat snake chain. Approx size 3.5" long x 2.5" wide. 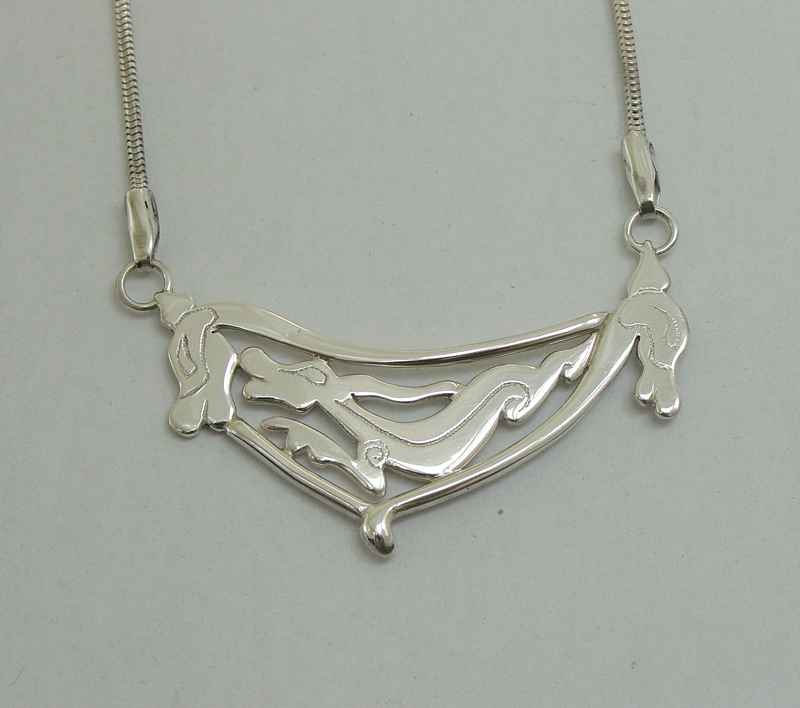 Animals pendant with inset stone on moving central piece through tubing. Layered sheet moving piece below stone. One -off piece. Zoomorphic style cut out animals with rounded terminal. On flexible links to snake chain. One -off. Animal and bird designs. 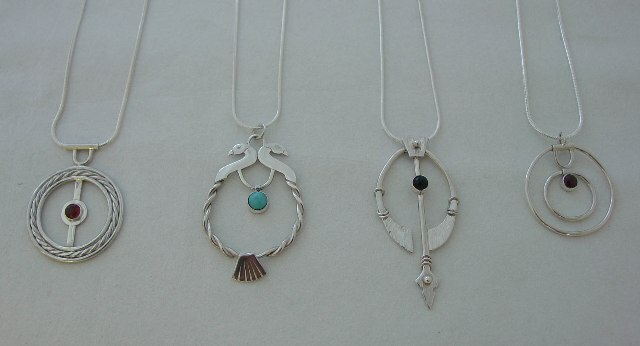 Left - animals with layered silver sheet and moving central piece set with turquoise, middle - sheet and wire birds set with lapis lazuli, right - animals with layered and textured silver sheet, set with lapis lazuli. 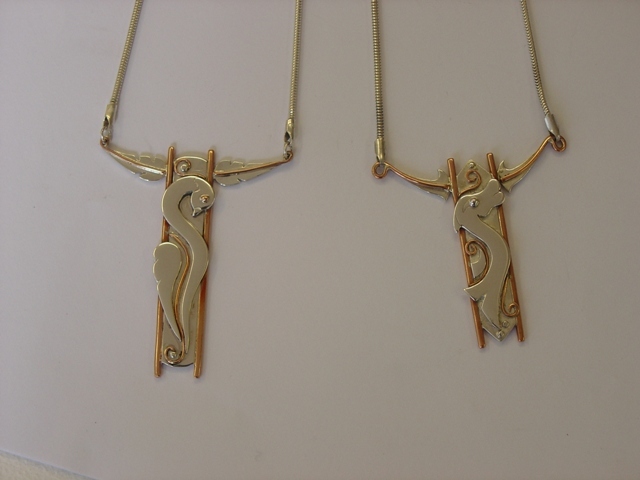 Sheet silver animals with hammer textured bodies in silver wire frame. 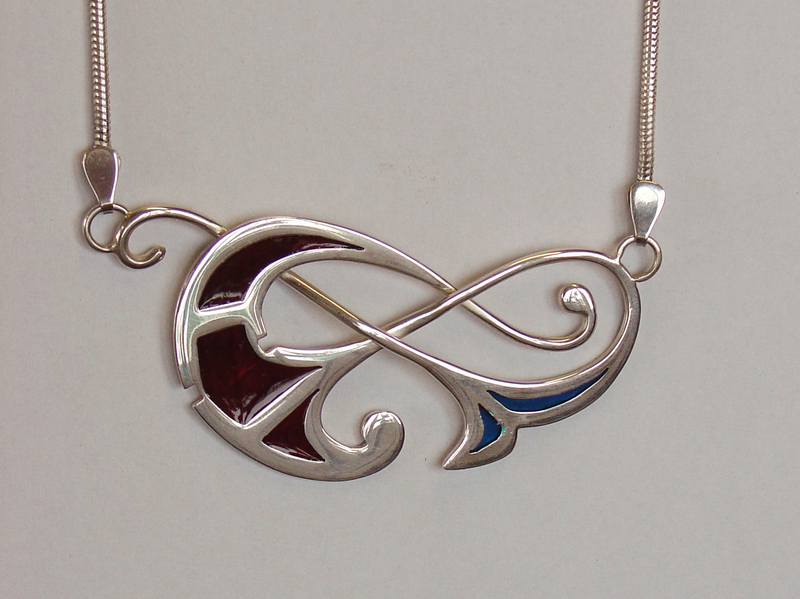 Hung on snake chain from tubing to allow pendant to move on chain. One-off. 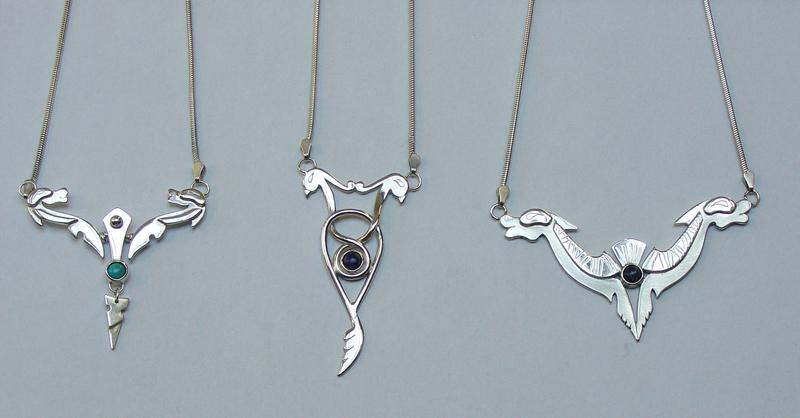 Selection of silver wire and sheet pendants with inset stones. 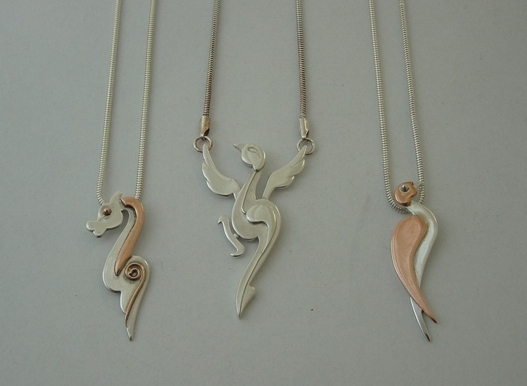 Selection of silver and copper animal and bird pendants with layered sheet silver and copper. Silver and copper with animals and birds set on long sheet silver backing, edged with copper wire and copper details. One-off pieces.